How many poultry units does Barclays help fund each year? It’s a growing part of our business, which in total supports a significant number of farms across the country, and employs approximately 200 dedicated colleagues specialising in banking for agriculture. How is this changing year on year & can you give an overview of how demand for poultry unit funding is evolving? We are seeing a strong upward trend. Our lending for egg and broiler farming combined was up more than 10% in the first half of 2018, compared with the same period the previous year. Both the egg and broiler sectors have been growing within agriculture for a number of years. Reports suggest that demand for poultry meat in the UK has been growing at about 3% a year. At the same time, government figures suggest that the increase in demand for free-range eggs means they are now the most produced type in the UK. Interestingly, we are seeing a growing number of new entrants from other areas of agriculture such as arable and dairy farming. This may be a response to Brexit, or reflect farmers simply wanting to diversify their businesses to create greater stability. As a bank, we are keen to support growth in production and the corresponding investment, and our outlook for the poultry sector is very positive. What are some of the common pitfalls when applying for funding for a new project? Like any bank, we look for a clear and realistic business plan. The good news is that the poultry sector is good at recording, and generally has very good management information – in relation to both specific projects, and the industry and its markets. Furthermore, it is usually possible to estimate the output of a project with some accuracy because production is less susceptible to bad weather and there tend to be solid supply contracts. That said, there are a few potential problems that are worth flagging, not least because they can usually be solved easily. Sometimes new entrants to the sector lack specific management expertise in poultry, even though they have experience in other areas of farming. In these cases, the difficulties can usually be overcome by hiring experienced staff and/or using a specialist consultant – either an independent one, or a field officer from the company that will process the produce. Another issue we sometimes see is when a business sets aside a small area of land for a poultry business, and plans to use this land as security for a loan. Sometimes the land isn’t valuable enough to meet the requirement for security for the loan, and further security may be needed. Also, even if further security isn’t needed, it may be helpful as it can reduce the interest rate on the loan. Farmers often find a discussion with one of our relationship managers really helpful when considering their options. How do poultry units compare to other types of farming in terms of return on investment? We generally see a higher return on investment in the poultry sector, with swifter repayment periods for debt. Indeed, it is this higher return on investment that allows the funding for the buildings and equipment required. It’s also worth noting that a poultry unit can help a farming business diversify and become more resilient, especially as its output is often less sensitive to the weather. How should farmers who are interested in expanding their poultry businesses approach you? Barclays has a huge network of experienced managers focused on agriculture across the UK. If you don’t know one already, they are easily contacted through our website via the agricultural managers. We can help and advise from an early stage. Indeed, the earlier we are involved the better. Our managers often become part of the extended team around the farmer, and this can prove invaluable. In addition, we also have access to a huge amount of experience and contacts within the industry, which can help as plans are being made. Further down the road, once planning permission is secured, a business plan will be needed in order to secure funding. Whilst some scorn business plans, the levels of investment required for poultry farming make it vital to have an idea of the payback period, levels of performance required and how the project works and will produce a return the farmer is happy with. Also, it’s often easier and more enjoyable than people think to create such a plan. 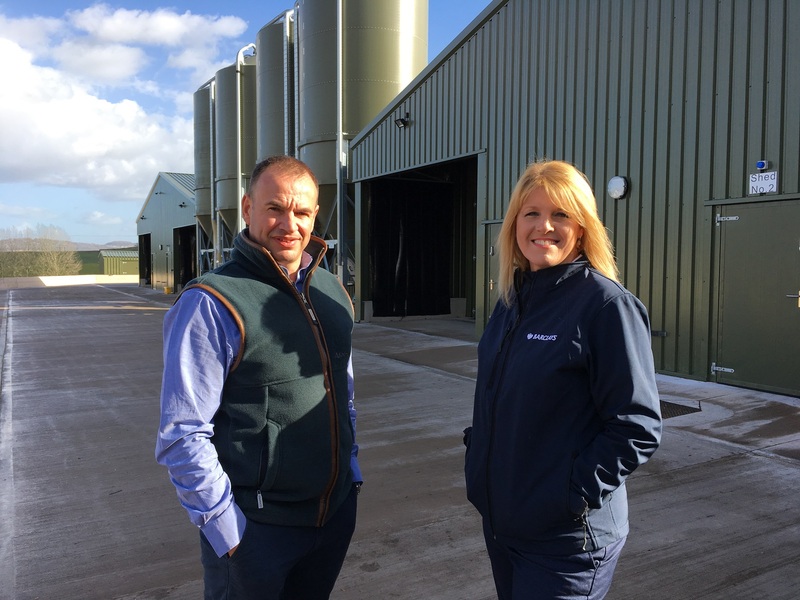 Crofty Growers invested £2.4 million to develop a poultry farm near Monmouth utilising the latest technology and animal welfare standards. Incorporating the latest green technology, the site is committed to delivering the lowest possible environmental footprint, using a biomass boiler and solar panels to heat and power the units. The business is owned by Richard Williams and the site is already a member of the ‘400 club’ a recognition of outstanding standards within the poultry industry and achieved by under 1% of the global poultry industry. “We house around 160,000 at any one time across the site and produce 7.5 crops per year,” says Richard Williams, owner of Crofty Growers. “The bespoke build from scratch has allowed us to deliver the highest standards of animal welfare and incorporate the latest technology. Birds can be monitored via our cutting-edge CCTV and if required changes can be made to the computer controlling the environment of the buildings. However, this technology is just another tool to aid the stockmanship of the on-site farm manager. With full traceability and the highest standards of care we ensure that every bird achieves the UK Red Tractor standard. Richard Williams continues: “It is important that we support the UK food production industry and encourage more, home grown producers. As part of the build we have installed a viewing window to provide full transparency and support our education project whereby we will be inviting local children to the farm to understand the importance of food production.